Saturday, June 2nd was a record breaking night! 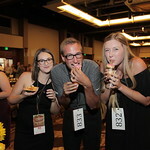 We welcomed over 800 guests to the culinary event of the summer, Bite Nite. It was a tremendous success, and we raised over $278,000! Your support helped us achieve our goal and raised the visibility of The ALS Association and the services available to our community. Thank you to all of our supporters, sponsors, volunteers, and everyone else who made it a fantastic night!